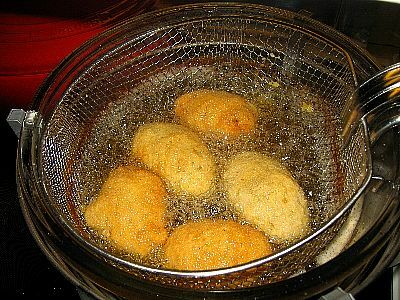 Deep frying: even more hazardous to your health than I realized. Yesterday marked the end of my 18-day stay in New York Presbyterian Hospital’s burn unit, where I landed after accidentally overturning a pot of hot cooking oil onto myself. I ended up with second- and third- degree burns over much of my legs, but after skin graft surgery and some physical therapy, I can walk again, albeit unsteadily, and I have skin on my legs again, albeit ugly skin. I learned a lot during my hospital stay. Unfortunately, nearly all of that hard-earned knowledge was in very specific topics – the ideal cocktail of pills, the least-uncomfortable position to sleep in, etc. – which will neither be applicable in other contexts nor interesting to other people. But I did leave with one realization about pain, and how we experience it. I wasn’t in constant pain for the entire 18 days, by any means, but every day featured at least a few painful experiences, from the minor (frequent shots) to the major (scraping the dead skin off the burns). I tried a handful of methods to deal with it. Deep breathing helped a bit, as did pulling my own hair. One friend suggested I try imagining myself existing at a point halfway across the room; that helped a little, but only because our philosophical argument over whether it was even possible to pull off such a mental stunt briefly distracted me from my throbbing legs. But the one thing that did seem to dramatically affect my pain level was my belief about what was causing the pain. At one point, I was lying on my side and a nurse was pulling a bandage off of one of my burns; I couldn’t see what she was doing, but it felt like the bandage was sticking to the wound, and it was agonizing. But then she said: “Now, keep in mind, I’m just taking off the edges of the bandage here, so this is all normal skin. It just hurts because it’s like pulling tape off your skin.” And once she said that — once I started picturing tape being pulled off of normal, intact skin rather than an open wound — the pain didn’t bother me nearly as much. It really drove home to me how much of my experience of pain is psychological; if I believe the cause of the pain is something frightening or upsetting, then the pain seems much worse. And in fact, I’d had a similar thought a few months ago, which I’d then forgotten about until the burn experience called it back to mind. I’d been carrying a heavy shopping bag on my shoulder one day, and the weight of the bag’s straps was cutting into the skin on my shoulder. But I barely noticed it. And then it occurred to me that if I had been experiencing that exact same sensation on my shoulder, in the absence of a shopping bag, it would have seemed quite painful. The fact that I knew the sensation was caused by something mundane and harmless reduced the pain so much it didn’t even register in my mind as a negative experience. Of course, I probably can’t successfully lie to myself about what’s causing me pain, so there’s a limit to how directly useful this observation can be for managing pain in the future. But it was indirectly useful for me, because it proved to me something I’d heard but never quite believed: that the unpleasantness of pain is substantially (entirely?) psychologically constructed. A bit of subsequent reading led me to some fascinating science that underlines that conclusion – for example, the fact that the physical sensation of pain is processed by one region of the brain while the unpleasantness of that sensation is processed by another region. And the existence of a condition called pain asymbolia, in which people with certain kinds of brain damage say they’re able to feel pain but that they don’t find it the slightest bit unpleasant. The relationship between pain and unpleasantness is a philosophically interesting one, in fact. Unpleasantness is usually considered to be built into the very definition of pain, so it’s quite confusing to talk about experiencing different levels of unpleasantness from the same level of pain. And it’s even more confusing to talk about experiencing no unpleasantness from pain, as people with pain asymbolia do. The idea feels almost as incoherent as that of being happy but not enjoying it, or doubling a number without making it any bigger. But observing my own experiences of pain a bit more closely has made it a little easier for me to wrap my mind around the idea. I really did feel, when the nurse informed me that she was pulling the bandage off of intact skin rather than burned skin, like the pain was the same but the unpleasantness was lessened. It’s harder to imagine pain with no unpleasantness, but perhaps my shopping bag example sheds a little light: I felt the sensation of something cutting into my shoulder, but it didn’t bother me. So maybe someone with pain asymbolia would experience a cutting sensation as if they’re just carrying a heavy shopping bag, with no “Warning!” and “This is awful!” alarms going off in their mind. I’ll have to think more about the relationship between pain and the experience of pain, because it’s still confusing to me, but at least I can feel like I got some new philosophical food for thought out of my 18 days at NY Presbyterian. Not to mention the very practical, un-philosophical lesson: don’t leave your giant pots of oil near the edge of the stove. Glad to hear you’re out of the hospital, Julia! Good to hear you’re back home and in good health! Any woman who has gone through childbirth will be able to tell you something similar. I was on crutches for the last few months of a complicated twin pregnancy and the pain was excruciating. I have sometimes thought that if I had not been doing it in order to bring two highly-desired and loved children into the world, I would likely have taken my own life – so complete was the pain and exhaustion. But I’ll be damned if I ate even an aspirin, and instead slid into the weird joy of being overtaken by two small people (the painful kicks, the aprehension, the syncopated hiccup…) that definitely changed the nature of what I was experiencing. It has also changed the way I respond to painful imagery later – even watching painful scenes on TV has become a visceral experience. SO sorry to hear of your accident and thanks for the nice article. Fascinating read, and a hearty welcome back! It’s good to hear that you are well. We’re all rooting for you. I had wondered what exactly had happened. I now know. Plus, I have a better perspective regarding pain. Double plus, I discovered this blog. Which now I will have to find for my kindle – most excellent! Nice to know you’re on the mend, Julia. And nicely written; leave it to a skeptic to take an experience like this and turn it into a scientific observation right in the middle of it. Best wishes as you continue to heal, and great post. Have you heard of Dan Ariely? He’s a burn survivor and behavioural economist whose books on rationality touch on his observations from the burn ward. I prefer Predictably Irrational but The Upside of Irrationality gets a bit more personal. I experienced pain without unpleasantness exactly once. I’m a former Buddhist, and in the particular sect of Buddhism I was in, the precepts ceremony (for laypersons committing to Buddhism) involved being burnt with incense. The incense stick wasn’t held onto my skin for very long, but it was long enough for a scar to form. Buddhist seated meditation gives you practice in dealing with low levels of pain over a long time. I was taking part in a Buddhist ceremony, so those tools were readily available due to context. I knew the pain was coming, and when, and that I would not be experiencing it for long. The pain was part of a positive experience. All these things contributed to my ability to deal with the pain. What I experienced was intense, but neither pleasant nor unpleasant: I knew it was pain, but it didn’t feel painful. Beautifully written, thoughtful piece– and I too am glad you are home again now. I can’t help but relate this insight about the perception of pain to my own experience with IBS. In the beginning, years ago, when I’d eat something that caused a painful flare-up, I wouldn’t know what to expect. The fear would mix with the pain to cause me to worry greatly about the length of the pain, whether it would magnify into some other physical problem, and so on. With experience, this changed. First of all I knew how to avoid causing flares.. yet even when they would– and still do– occur, I began to know the parameters of what I was dealing with- that the intensity would gradually diminish, that nothing terrible beyond the pain itself would result, and so on. The intensity of the pain never changed, only my perception of it. The lengths some people will go to just to get a story! Seriously, a very interesting response. I feel the same about the needle-stick for giving blood: knowing it’s not a dangerous injury, just a controlled and necessary procedure for a good reason, I process the pain differently. I feel the pain, but don’t experience it as being as unpleasant as if I accidentally jabbed myself. I knew there was a reason I avoid deep frying at home. Everybody, that’s what restaurants are for. Best wishes for your continued recovery. reminds me of something that’s happened to me more than once. i’ll be working on my car or some light house repair and i’ll cut or scrape myself but not notice it for 10 or 15 minutes. it never once hurts until i actually see the wound and then it starts throbbing. not nearly as painful as what you endured, but similar nonetheless. Glad to hear you’re doing better and thank you for writing such a thought provoking piece. I really enjoyed it! I have changed my grocery shopping experience by pretending the bags are weights that I am lifting to build strength. I find it actually quite ….enjoyable? now. Whereas previously I really dreaded that long walk home. Steve & I wish you the very best in your recovery, Julia! I am glad you are on the road to recovery! Glad you are healing, and welcome home! Well written. Well done. Welcome back Julia. In addition, I think this may have been the first time that someone from our community, someone who many of have met at a meeting or two, someone who we have developed a friendship through the new media, who is young and in their prime, has suffered a serious mishap. Your injury, I think, shocked us and saddened us all Julia. I’m truly glad you are feeling better. Obviously, we all are. Clearly the events of the past few weeks have not effected you ability to think and communicate rationally or turn a phrase. If I lived closer I’d be offering to bring over meals or something. The best I can do is wish you a speedy and uneventful recovery! I’m sad knowing you had a horrible experience due to the accident, but I’m grateful you’re out of the hospital! Thanks for sharing your wonderful epiphanies about pain. I also experienced a lot of pain.But every time I encounter one, I am reminded that the WOUNDED HEALER is always there for me to help me through the entire healing process. Isn’t our Lord wonderful? Well-written and insightful as always, Julia. Glad you’re out of the hospital and best wishes for a complete–and pain-free–recovery. It’s good to have you back. I wish you a happy, healthy, and sweet new year. I noticed that when I am in a particularly peaceful state of mind (e.g. after meditating) I can sustain breaking a toe or pouring boiling water on myself without much unpleasantness. (In the case of the burn it hurt more the next day when I hadn’t meditated than during the few seconds after it happened.) I’m not sure if that is abnormal or not. I vaguely remember how it felt many years ago when I pulled a tray of dilution blanks (mostly water) out of an autoclave and spilled them down the fronts of my legs. Scary painful, but I didn’t lose any skin. I can’t imagine how much worse it would be with oil. I’ve had back pain from arthritis and damaged discs for about 20 years, and what helped the most was when I finally told myself consciously, “it’s just pain. It won’t kill you.” It doesn’t really hurt less, but I can function around it. Nice article, and I’m glad you’re recovering. If you’ll forgive the expression: DEAR GOD, I am so sorry you had to go through that! I hope it wasn’t quite as bad as I try not to imagine. And perhaps you will lead a more fearless life knowing you’ll have few opportunities to have a more painful experience. – I wonder if my definition of pain isn’t technically correct. I imagine that if I was experiencing pain without unpleasantness, I wouldn’t even think it was pain, just…a feeling, like tiredness. Perhaps it’s akin to feeling sore after intense work/hike/ultimate frisbee game, something else I don’t quite call pain, despite it probably being traceable to the same signals the muscles would send from being injured in a less constructive way. I’m just not sure I can get into my own head enough to distinguish between the pain and the unpleasantness of it – now every time an injury stops hurting as much, I’ll be wondering if it really stopped hurting so much or if my attitude just changed! – You probably won’t be able to flat out lie to yourself, but it’s possible you could take advantage of uncertainty combined with optimism, especially if you’re being examined and treated by others. If you thought “well, I can’t see that spot, and I originally feared it was injured, but there’s a good chance it will have healed by now even if it was hurt; for all I know the area that’s still-burned is just dime-sized by now!” would that help? I sometimes do this kind of thing when I have a deep cut: when I change the bandage, cursory glance at the area to make sure it’s not completely rotting, then just don’t look at it too close while I re-dress it, and assume scabbed areas are already mostly back to normal underneath. (Though naturally you should still do more serious progress checks periodically.) Seems to help a bit, though it’s hard to picture how I’d apply it to a much broader injury. Holy cow – I had no idea that was why this blog had gone quiet. I know you must have a lot of healing left to do, but I’m glad to hear you’re out of the hospital and on the mend. I was burned on my legs in a camping accident a long time ago. It was pretty bad, though not nearly as bad as this sounds, and I can say from experience that burns are definitely the worst kind of injury to have. This post is impressively scientific and dispassionate, considering everything you’ve undoubtedly been through! But once I had the MRI and they advised me that I was to be operated on right away I felt the pain lose its grip on me. I felt better just knowing what the issue was, and that a surgeon was ready to fix me. I really do think you are onto an extremely interesting topic of study here. Don’t limit it to one essay, there’s more here! Take care Julia. Heal well. I was very impressed when I met you @ TAM 8…keep up the good work!! I think this could be the start of something interesting where you could experience awful things to gain valuable insights into them. You should ask people to suggest what your next investigation should be and do an online poll to decide which one to do next. i wonder at your commitment at analyzing things and penning it down neatly with a tinge humour, admist all pain. hats off. get well soon. I actually experience chronic pain, on the right side of my head. It’s been over 10 years since it started, and the odd thing about it is that it has been so long since this pain registered as “unpleasant” or bothersome I don’t even remember what it was like when it hurt in a way that really bothered me. Now I just notice the pain, and feel about as indifferent to it as I would to a breeze on the side of my head, or noticing clothes pressed against my skin – it’s there, it’s definitely registering as “pain”, and yet it doesn’t really interfere with or upset me at all. I’m glad you’re shedding light on the psychology of pain and suffering; this is definitely an area that we should be doing a lot of research in, as the implications are rather profound. I’d love to see some effective therapies or techniques for controlling pain psychologically. Wow, that sounds like a terrible experience. I’m glad to hear that you are on the mend and that you were able to extract something constructive from it (but, I must admit, primarily the former). A very interesting perspective – thanks for sharing it with us. You have done Burning Man and burning woman now. What about Burning Goat in Sweden this year.